This is our 8th blog on eCommerce personalization. In our previous blogs, we have looked at various aspects of eCommerce personalization like benefits, myths, steps to personalize, email personalization and more. But, one thing that has remained true across all the blogs is the importance of content in eCommerce personalization. 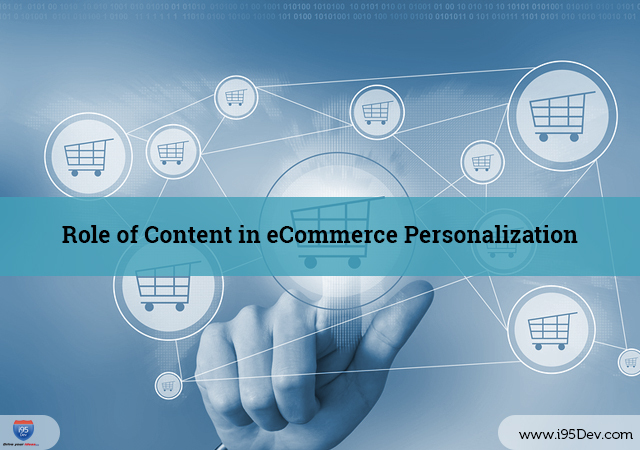 In this blog, we will look at the role of content in eCommerce personalization in little more detail. Most eCommerce websites display unexciting and generic content to all visitors, which no matter how hard they try, ceases to make an impact. The very purpose of eCommerce personalization is to be able to stop sharing the generic content and instead attempt to drive a personal conversation. But, what do you do? A customer visits your eCommerce store and you identify the user and the products he/she last viewed. What next? What do you show the customer? A similar product? A coupon? An article talking about the product he/she last purchased? Hence, it is important to identify the content that you can share with your customers. Now this can vary based on the where the user is in the buyer journey and the trigger (the last product purchased, the reference site, abandoned cart, etc.) that you are leveraging. Businesses must identify these triggers, build workflows and develop content to move the user further in the buyer journey. Step 0 – Identify the segments you want to target, segment your customers into those buckets and have the required tools to deliver the message. Step 1 – Identify the important triggers like abandoned carts, second visit, email CTA, and more. Personalized content stands a better chance of being noticed and driving action. Publishing and sharing relevant personalized content positions you as an authority and can work better than a PR campaign. The delivery medium/ channel also plays an important role in effectiveness. Carry out an audit to identify important channels for your customers and your business. Every interaction is an opportunity to personalize and drive conversion with customers. Building strong relationships and establishing brand loyalty takes time. Catching your customers’ attention can be relatively easy; the bigger challenge lies in retaining their attention. While personalization goes a long way in retaining their attention, content without a strand of doubt is at the heart of the whole effort.